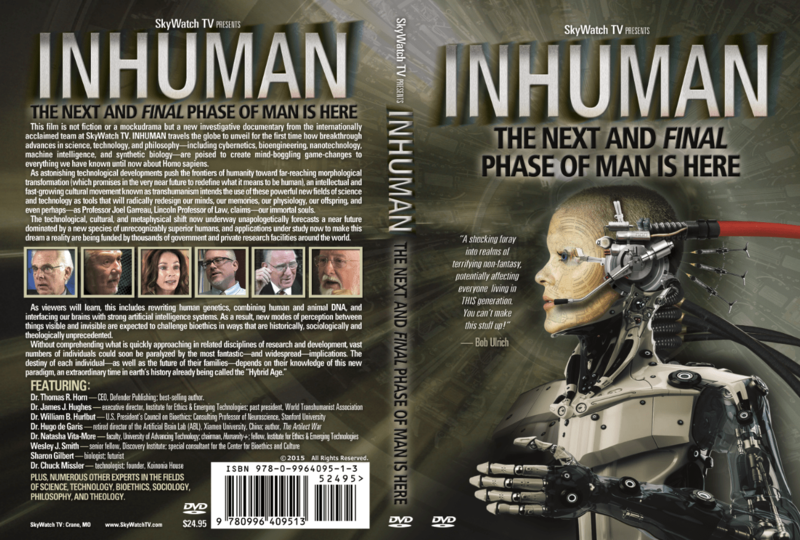 EDITOR’S NOTE: In the countdown to the release of the highly anticipated documentary “INHUMAN: THE NEXT AND FINAL PHASE OF MAN IS HERE”(scheduled for release in September), SkyWatch TV is running this exclusive online series on transhumanism and the dawn of the Human Hybrid Age. In the last entry we concluded with an article by the Daily Mail (“Meet the Nano-Spiders: The dna Robots that Could One Day Be Walking through Your Body”) reporting on the creation by scientists of microscopic robots made of dna molecules that can walk, turn, and even create tiny products of their own on a nano-scale assembly line. This feature is important because a few years back, my wife Nita brought up a point that I had never considered. She asked if the biblical mark of the Beast might be a conspiracy employing specific implantable technology only now available. Her theory was gripping. An occult elite operating behind the U.S. government devises a virus that is a crossover between human and animal disease—let’s say, an entirely new and highly contagious influenza mutation—and intentionally releases it into the public. A pandemic ensues, and the period between when a person contracts the virus and death is something like ten days. With tens of thousands dead in a few weeks and the rate of death increasing hourly around the globe, a universal cry for a cure goes out. Seemingly miraculously, the government then steps forward with a vaccine. 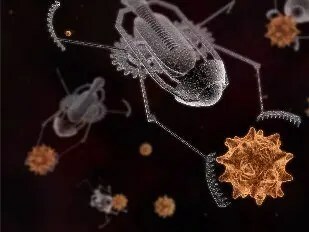 The only catch, the government explains, is that, given the nature of the animal-human flu, the “cure” uses animal dna and nanobots to rewrite one’s genetics so that the person is no longer entirely human. The point made was that those who receive this antidote would become part “beast,” and perhaps thus the title, “mark of the Beast.” No longer “entirely human” would also mean—according to this outline—that the individual could no longer be “saved” or go to heaven, explaining why the book of Revelation says “whosoever receiveth the mark” is damned forever (while also explaining why the Nephilim, whose dna was part human and part animal, could not be redeemed). If one imagines the global chaos of such a pandemic, the concept of how the Antichrist “causes all,” both small and great, to receive this mark becomes clearer. When looking into the eyes of dying children, parents, or a spouse, it would be incredibly difficult to allow oneself to die or to encourage others to do the same when a “cure” was readily available. Lastly, this scenario would mean that nobody would be allowed to “buy or sell” in the marketplace without the mark-cure due to the need to quarantine all but the inoculated, thus fulfilling all aspects of the mark of the Beast prophecy. What is human? Until recently, most of us would readily respond that we are humans. You and I, we might argue, are Homo sapiens: erect, bipedal hominids with twenty-three pairs of matched chromosomes and nifty little thumbs capable of apposition to the palm that enable us to grasp the fine tools that our highly developed, bi-lobed brains devise. Humans, we might argue, sit as rulers of the earth, gazing down from the pinnacle of a pyramid consisting of all plant and animal species. We would remind the listener that natural selection and evolution have developed mankind into a superior thinker and doer, thereby granting us royal privilege, if not infinite responsibility. The Bible would take this definition much farther, of course, adding that mankind is the only part of God’s creation formed by His hands, rather than spoken into existence, and that you and I bear God’s unique signature as having been created “in His image” (Genesis 1:27). Many members of the “illuminated brotherhood of science” would likely demur to the previous statement. These have, in point of fact, redefined human. Like Shelley’s Modern Prometheus, Victor Frankenstein, today’s molecular magicians play “god” not by stitching together rotting corpses, but by reforming the very essence of our beings: our dna. So-called “postmodern man” began as a literary reference but has evolved into an iconic metaphor representing a collective image of perfected humanity beyond the confines of genetic constraints. Transhumanism, also known as the H+ movement (see www.HPlusMagazine.com, for example) envisions a higher life-form yet, surpassing Homo sapiens in favor of Homo sapiens 2.0, a bioengineered construct that fuses man’s original genome with animal and/or synthetic dna. You two speak to the heart of the matter when you warn of a day when true humans may receive transhuman instructions via an implant or injection. A seemingly innocuous vaccine or identification “chip” can initiate intracellular changes, not only in somatic or “body” cells but also in germ-line cells such as ova and sperm. The former alters the recipient only; the latter alters the recipient’s doomed descendents as well. In my second novel, The Armageddon Strain, I present a device called the “BioStrain Chip” that employs nanotechnology to induce genetic changes inside the carrier’s body. This miracle chip is advertised as a cure for the h5n1/ebola chimera that is released in the prologue to the book. Of course, if you’ve read the novel, then you know the BioStrain chip does far more than “cure”—it also kills. Though a work of fiction, The Armageddon Strain raises a chilling question: What limitations lie within the payload of a biochip? Can such a tiny device do more than carry digitized information? Could it actually serve as the mark of the Beast? Dna (Deoxyribonucleic acid) has become the darling of researchers who specialize in synthetic constructs. The “sticky-end” design of the dna double-helix makes it ideal for use in computing. Though an infinite number of polyhedra are possible, the most robust and stable of these “building blocks” is called the double crossover (dx). An intriguing name, is it not? The double-cross. Picture an injectible chip comprised of dna-dx, containing instructions for a super-soldier. Picture, too, how this dna framework, if transcribed, might also serve a second, sinister, purpose—not only to instruct, but also to alter. Mankind has come perilously far in his search for perfection through chemistry. Although millennia passed with little progress beyond roots, herbs, and alchemical quests for gold from lead, the twentieth century ushered science into the rosy dawn of breathless discovery. Electricity, lighter than air travel, wireless communication, and computing transformed the ponderous pace of the scientific method into a light speed race toward self-destruction. By the mid-1950s, Watson and Crick had solved the structure of the dna molecule and the double helix became all the rage. Early gene splicing, and thus transgenics, began in 1952 as a crude, cut-and-paste sort of science cooked up in kitchen blenders and petri dishes—as much accident as inspiration. As knowledge has increased (Daniel 12:4), genetic scientists learned to utilize microbiological “vectors” and sophisticated methods to insert animal or plant genes from one species into another. It’s the ultimate “Mr. Potato Head” game, where interchangeable plastic pieces give rise to an infinite number of combinations; only, in genetic splicing, humanity is the unhappy potato. Vectors provide the means of transport and integration for this brave new science. Think of these vectors as biological trucks that carry genetic building materials and workers into your body’s cells. Such “trucks” could be a microsyringe, a bacterium, or a virion (a virus particle). 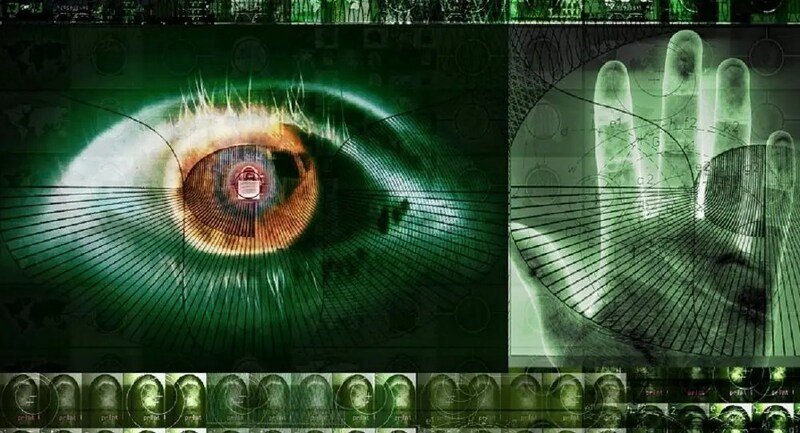 Any entity that can carry genetic information (the larger the load capacity, the better) and then surreptitiously gain entry into the cell is a potential vector. Viruses, for example, can be stripped of certain innate genes that might harm the cell. Not only does this (supposedly) render the viral delivery truck “harmless,” it also clears out space for the cargo. Once inside the cell, the “workers” take over. Some of these “workers” are enzymes that cut human genes at specific sites, while others integrate—or load—the “cargo” into appropriate reading frames—like microscopic librarians. Once the payload is stored in the cell’s nuclear “library stacks,” the new genes can be translated, copied, and “read” to produce altered or brand-new, “alien” polymers and proteins. The resulting hybrid cell is no longer purely human. If a hybridized skin cell, it may now glow, or perhaps form scales rather than hair, claws rather than fingernails. If a brain cell, the new genetic instructions could produce an altered neurotransmitter that reduces or even eliminates the body’s need for sleep. Muscle cells may grow larger and more efficient at using low levels of calcium and oxygen. Retina cells may encode for receptors that enable the “posthuman being” to perceive infrared or ultraviolet light frequencies. The hybrid ears may now sense a wider range of sounds, taste buds a greater range of chemicals. Altered brains might even attune to metaphysics and “unseen” gateways, allowing communication with supernatural realms. Germ-line alterations, mentioned earlier, form a terrifying picture of generational development and may very well already be a reality. Genetic “enhancement” of sperm-producing cells would change human sperm into tiny infiltrators, and any fertilized ovum a living chimera. Science routinely conducts experiments with transgenic mice, rats, chickens, pigs, cows, horses, and many other species. It is naïve to believe humans have been left out of this transgenic equation. If so many scientists (funded by government entities) believe in the “promise” of genetic alteration and transgenic “enhancement,” how then can humanity remain human? We cannot. We will not. Perhaps, some have not. Spiritually, the enemy has ever sought to corrupt God’s plan. Originally, fallen angels lay with human women to corrupt the original base pair arrangements. Our genome is filled with “junk dna” that seemingly encodes for nothing. These “introns” may be the remains of the corrupted genes, and God Himself may have switched them off when fallen angels continued their program, post-Flood. If so, today’s scientists might need only to “switch them back on” to resurrect old forms such as Gibborim and Nephilim. In the final days of this current age, humanity may indeed “flip.” Paul tells us that Christians will be transformed in a moment (1 Corinthians 15:51–53). Is it possible that the enemy also plans an instantaneous “flip”? Are genetic sleeper agents (idling “trucks”) already at work in humanity’s dna, waiting and ready to deploy at the appropriate moment? Science is ready. Knowledge has been increased. The spiritual players have taken the stage. All we need is the signal. The sign. The injection. The mark. The moment. We shall all be changed. Some to incorruptible bodies ready to meet the Lord. Others to corrupted genomes ready to serve the Beast. COMING IN JUST A FEW WEEKS FROM NOW… THE MULTI-YEAR DOCUMENTARY PROJECT THAT WILL STUN THE CHURCH! !